Paddon, 28, has been driving an i20 WRC on a part-programme for the last two years but will start his first full season in the WRC next year. "I am very excited to sign with Hyundai Motorsport for a further three years," said Paddon." The past two seasons have been an amazing journey and we have grown a lot. "The team has helped me to develop and based on the rate that we have progressed together I have no doubt we will be winning soon." Paddon and co-driver John Kennard led the Rally of Italy in the summer before finishing second in Sardinia. Since then the Kiwi has regularly been the fastest of the Hyundai drivers, regularly casting the supposed team leader Thierry Neuville into the shade. Paddon had been in discussions with other teams about a seat for next season, but the lure of a long-term agreement allied to two all-new i20 WRCs in the next two years convinced him to stay with the team. "We are all working and striving towards becoming world champions and I firmly believe Hyundai Motorsport will offer me the best opportunity to achieve that goal," he said. "First and foremost, though, we must target our first rally victory and that is my personal target for 2016." Team principal Michel Nandan added: "I am delighted that we have been able to extend our partnership with Hayden for a further three years and to have him compete in all rounds of the WRC with us. "Since he joined the team early last year, he has proven to be a worthy addition to our young team. "He is consistent, quick and determined and with even more potential for growth. "From the start of our WRC programme, we have wanted to support fresh, young talent and Hayden has shown just how successful this can be. 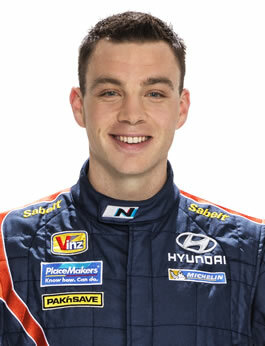 "I am personally looking forward to see what he can deliver over the next three years with Hyundai Motorsport." Paddon, Neuville, Dani Sordo and Kevin Abbring are all under contract with Hyundai next season.